En Blanc After Dark, concept has been held in major cities like NYC, DC, Miami, Atlanta, Chicago, Baltimore, Orlando and now Jacksonville. What is en Blanc After Dark? It is an elegant, picnic dinner and dance party under the stars. 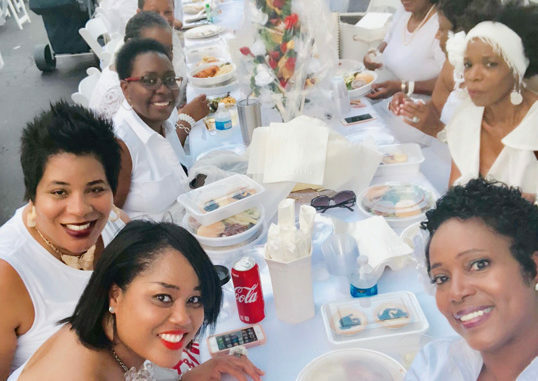 Earlier this month, dozens of women experienced the glam of the exclusive popular all-white dinner that is designed to take the stress out of the party experience by allowing for more fun and convenience. While the themed party has grown in popularity nationwide, the guest make this event come alive. There is no hauling of tables and chairs to a secret venue; tables, chairs and linens are provided by organizers. Attendees are guided to grab a picnic basket, wine or champagne and dine under the stars at the secret location and were entertained by a live band and DJ with white linen tables chairs. The mystery of the event is the fun part. Guests know the event will take place in Jacksonville, but the exact location is revealed the day of. The goal is to reminisce on history and discover the “new” that Jacksonville has to offer from parks, waterfronts, museums, and skylines. Creative decor, hats, belts and gloves set the tone for this festive outdoor evening. Everyone becomes a foodie for the night and goes all out in creating, preparing and packing unique foods to be shared with friends both new and old. After set up is complete, guests are encouraged to wander the venue to see what others have created and meet new people. Shown are guest enjoying an after dark experience at the Lexington Hotel. 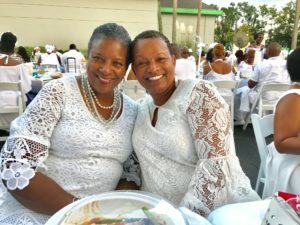 Shown are guest enjoying their after dark experience at the Lexington Hotel (Shown below l-r is Sandra Malone and Barbara English.